J39 Java Pedestal Backwash Shampoo Unit w/ large 8700 Tilting Porcelain Bowl. 16" x 16" cabinet w/ hinged plumbing-access door is free standing. Jeffco suggests installing this unit on 32" centers. 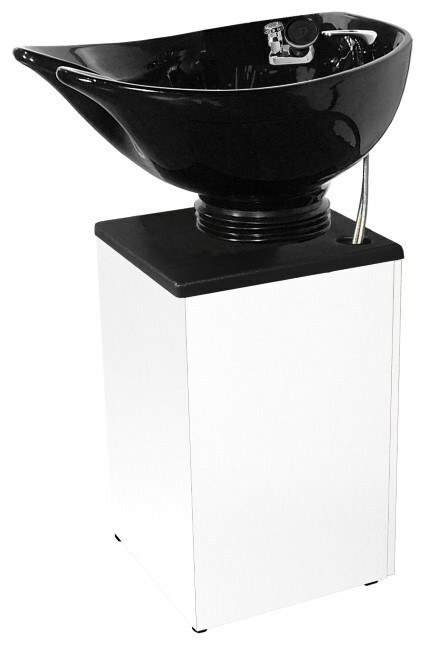 The black 8700 Bowl tilts 6" and includes fixtures and vacuum breaker. This unit can be used for backwash or sidewash, as desired. Shampoo chair is ordered separately.